Last week, I was helping a client produce a YouTube video and I explained the various steps involved in the production process. After our meeting, it hit me that the list of steps could be a valuable blog post for anyone interested in creating their own video. So, if you are thinking about shooting your own YouTube video and don’t know where to start, this post is for you. The list below is a great starting point and covers the essential elements to consider while planning and creating your video production. a. How original is the idea? Has it been done 50 times already or is it a new angle? Will you build upon or parody an older concept? Originality is key. c. How viral can your concept be? Is it something you believe your target market will enjoy enough to pass along? d. Location, location, location. Where are you going to shoot the video? Shooting a video in a baseball stadium would be great, but is that really possible? Is a park better? Do you need permission to be there? So on and so forth. e. How complex will the editing be? Will you need to create a dozen effects for the final edit? How will you accomplish that? Do you even have the software or skillset to do it? Excellent, you have your concept and it’s a killer idea that’s completely possible to shoot on your budget. :) Now what? Well, it’s time to write your script. This is also not an easy task. If you’ve never written a script before, there’s a good chance that you’ll be in pain. If you find yourself cooking along, then you might want to do this full time. :) Personally, I love this stage… This is where you get to flesh out your concept. The script and storyboard are the foundation for your production. If you have a poorly mapped out script and storyboard, you are setting yourself up for failure. Take as much time as you need at this stage to get it right. You should determine your main characters, how much dialogue will there be, determine locations for the shoot, and of course begin writing the actual script. Just to clarify, the script covers what your characters will be saying and doing during the shoot, where the storyboard helps you map out the flow of the video. Keep in mind that the storyboard doesn’t have to be a work of art…I’ve created several storyboards that were on 8.5×11 sheets of white paper, framed with pencil, using stick figures. I’ve also developed some storyboards that were more elaborate…it’s all about timing and how involved your production will be. By now your script and storyboard should be done. Now you need to create your shot list from your script and storyboard. A shot list is essential. It helps you determine every shot you need for your production. And it’s not just about your core shots, it’s also about getting additional footage for your edit. For example, if you were shooting at a baseball field like I mentioned earlier, you definitely need to get some establishing shots. Maybe you will pan up to reveal the stadium sign or get a 360 shot from inside the stadium. You need to think about all of your shots or you’ll find yourself cursing a lot in post production. :) The shot list can be a simple Word document listing each shot you need to capture with some notes about the scene. 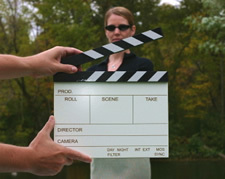 In addition, I would buy a clipboard and attach the script, storyboard, and shot list to it on the day of your shoot. If you are going to capture a lot of motion, definitely look into building or buying a steadicam or glidecam. There is almost no way to achieve smooth motion without one… Don’t believe me? Grab your camera and walk down your street while shooting. Watch it back and see how fast you get motion sickness. :) A steadicam or glidecam will help smooth out those bumps and can provide a cinematic effect that’s hard to achieve without using one. Note, you will need to practice to achieve smooth motion while keeping your subject in the frame, but it’s well worth it. If you want to build a steadicam, then check out the poor man’s steadicam. I built one a few years ago to see how it would work and it actually works really well. It cost me $25-$30 for supplies and then took me 2 hours to build. If you want to buy a Glidecam, then you might want to check out http://glidecam.com/product-2000-pro.php to learn about the Glidecam 2000. I believe it’s their least expensive product. If you will be shooting any interviews, make sure you have a good location with a nice backdrop. If you want, you can also buy a professional backdrop for about $60-$100. If you think you’ll be shooting several more video interviews, then you can also buy a frame to hold backdrops for about $150-$200. It’s a small investment and will bring a level of professionalism to your production. Now that your video shoot is over, run back to your office to log and capture your footage. Actually, depending on how much footage you shot, you just might want to capture all of it. Hard drive storage is so cheap now that it just might be easier to capture all of the footage. If you need to log and capture your footage, just make sure you give yourself a few seconds before and after each clip (so you have room for editing on each side of the clip). There are several popular video editing software packages to choose from. Which one you go with really depends on your requirements. I highly recommend both Adobe Premiere andApple Final Cut. Both packages are not cheap, but well worth the money. In addition, I believe both have “light” versions of the software for less money. In my opinion, you probably won’t need all of the power of Final Cut or Premiere, so the light versions may work well for you. I would try and keep your YouTube video less than 3 or 4 minutes in length. Attention spans are lower than ever, so if your video is 15 minutes long, good luck. Keep it clear and concise. Keep your viewers in mind. Most people don’t have time to sit through more than a few minutes. Factor this in as you edit. Since you’ll be providing your video on several video sharing websites (including YouTube, Google Video, Daily Motion, and numerous other video sites), you’ll want to add bumpers to your video. Bumpers are basically short segments at the beginning and end of your video that provide viewers with information about the production. This is a great place to add the product name, company name, URL, etc. In addition, since viewers have the ability to add your video to their own websites or blogs from YouTube and the other video sites, adding a URL to learn more about your subject matter is a smart idea. This is where bumpers can play an important role in driving viewers to your website or blog! In closing, I know this was a lot of information, but I hope it gives you the confidence to produce a well made YouTube video! At a minimum, I hope this post contains enough information to get you started. I plan to write more posts about interactive video production so definitely check back often. As usual, if you get frustrated and need assistance, don’t hesitate to contact me. Now, begin your divergent thinking and create a killer YouTube video!